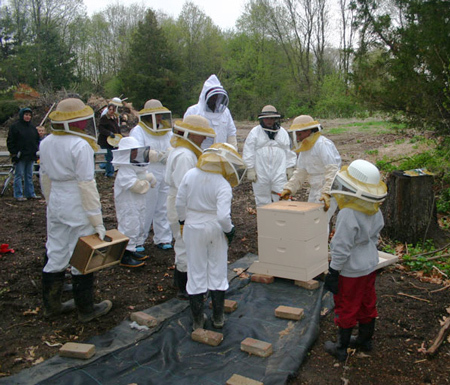 The Kalamazoo Bee Club has operated an apiary at several different locations over the years for the purpose of hands-on education and to share different beekeeping techniques and hive configurations. The main apiary is located at WMU Business & Technology Park and is also the home of WMU Student Apiary (corner of Drake and Parkview in Kalamazoo.) A second apiary is located at the Delano Homestead at the Kalamazoo Nature Center, see maps below. Apiary Days are normally held May through October, weather permitting. MOST but not all Apiary Days take place at the WMU location, as noted in the list. Anyone is invited to join us at the apiary for an up-close look and some hands-on beekeeping; events are free. Bring your own protective suit / veil if possible; a limited amount of protective wear is available through the club. All participants must sign a safety release; we’d appreciate it if you review and sign it prior to the event; we’ll keep them on file. Thank you. April 28: Package installation, along with general checking of other hives–at main apiary at WMU BTR PARK. May 18: Seasonal checks, hive equalization, Varroa checks, possible splits–WMU BTR PARK. June 8: Apiary Day AT Kalamazoo Nature Center, Delano Farm. More details to come as we get further into bee season. For Apiary Days at the Club Apiary, we meet at the lower level of the parking garage on the Southeast side of the WMU College of Engineering Applied Science Campus. See map below. You can click on the “directions” link to get specific directions from your location. You can click on the “directions” link in the map below to get specific directions from your location.